An area which houses middle-class families will attract lot of unorganised retail outlets, while luxury destinations mostly juxtapose with high-end retail. Whenever I am asked how real estate is performing in India, I have to ask the questioner to be a bit more specific. Real estate is not a single industry but consists of various categories/asset classes, and each behaves differently at the same time and at different times. Residential, commercial and retail real estate each serve a separate and distinct purpose, respond to a different type of demand and attract different types of investors. However, it is equally true that all three categories are inter-related because they all depend on each other to drive growth. Residential projects tend to crop up around commercial office catchments, because that is where jobs are created, and employment drives the financial ability and appetite for home ownership. Likewise, retail real estate developments are only feasible in and around residential and commercial catchments, since retail needs customers. What differs in these three asset classes are the ticket sizes, investment rationale, and investment horizon. 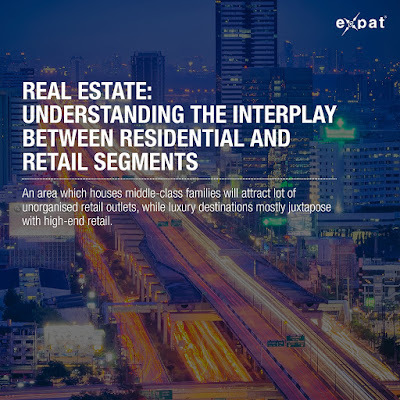 To invest in either residential, retail or commercial office, real estate calls for different degrees of financial capacity, risk appetite, patience and understanding of what drives growth in each of these asset classes. 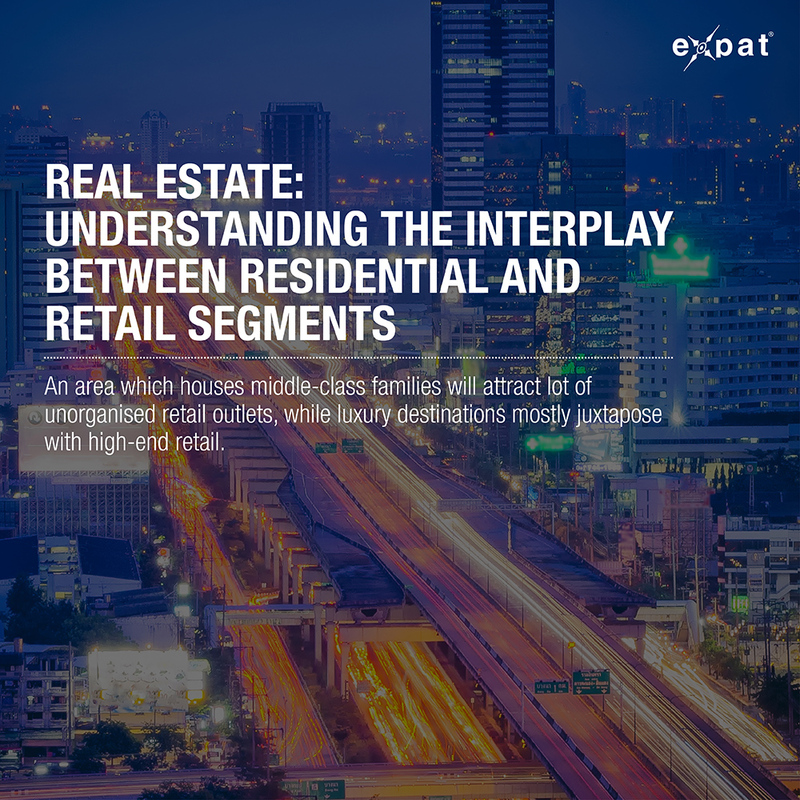 Among the various interplays between these real estate categories, the relationship between residential and retail is particularly interesting. In any given location, a certain type of retail follows (or sometimes even spawns) a corresponding type of housing. An area which primarily houses middle-class families will attract a lot of unorganised or mom-and-pop retail outlets, hypermarkets which enable value shopping for daily needs, and malls with a lot of mainstream brands. Likewise, luxury housing destinations are most logically juxtaposed with high-end retail. At the same time, India’s urban real estate landscape cannot really be clearly defined in terms of mid-income and luxury housing, as a significant number of residential areas in our cities are home to both middle-class and HNI residents. Indiranagar, Bengaluru: The high-street retail area in this location is located in an upscale residential precinct. The stretch has a good mix of F&B and fashion retail, attracting the affluent population near the market. Its strategic location has been the main growth catalyst for the retail market. While the inherent catchment of prime residential areas in and around Indiranagar contributes to steadily growing footfalls along this stretch, IT parks and offices in the vicinity also act as footfall drivers for this high street shopping destination. Galleria Market, Gurgaon: This is an upscale neighbourhood shopping area juxtaposed with one of the most developed areas of Gurgaon where plotted developments, residential colonies and high-rise apartment complexes coexist. Galleria Market has a mix of fashion and mainstream retail stores offering convenience-based categories in addition to F&B. Other categories in the retail tenant mix here include apparel, medical stores, accessories, stationery and gift stores. Hiranandani Estate, Powai (Mumbai): The iconic Hiranandani Estate is very close to major commercial office destinations within the Powai precinct. Nestled amidst high-end residential apartments and landmarks like the Powai Lake, it attracts footfalls from upper-middle-class to HNI residents. F&B is a dominant category in this high street with multi-cuisine restaurants, ice cream parlours and a few pubs. Mehar Chand Market, Delhi: This market is situated near Lodhi Colony in heart of New Delhi and is more or less a ’boutique’ shopping destination for residents living around it. It includes an eclectic mix of retail categories such as designer stores, organic grocery stores, quirky apparel stores, trendy bistros and stationery shops, among others. Mehar Chand Market attracts steady footfalls as it is surrounded by the upmarket residential neighbourhood of Jor Bagh, Defense Colony, Golf Links and Sunder Nagar. Road No. 36 Jubilee Hills, Hyderabad: Road No. 36, situated in Jubilee Hills’ upmarket residential area, is a prime and upscale shopping street in Hyderabad. Traditionally a posh residential area, Road No. 36 has transformed into a prime destination High-Street of Hyderabad. Due to its location, this high street has attracted a number of national and international retail brands, as well as exclusive cafes and restaurants. Breach Candy, Mumbai: This is one of the core South Mumbai areas known for its elite high-end residential neighbourhood. Most of the shoppers on this high street belong to the immediate or nearby catchment areas. Breach Candy hosts some of the legacy high street brands and has attracted a lot of local high-end fashion designers, as well. While it is always tempting to claim that real estate development in India evidences no clear planning, the logical manner in which residential and retail spaces follow each other seems to tell a different story. Granted, there is in most cases no pre-determined town planning involved — but the fact remains that Indians can nevertheless match their shopping preferences with their inherent purchasing power. Like water, lifestyle appears to always find its own level in India. If you are interested in Retail and Residential properties, you might want to check out Vida Uptown Township, Goa. 2018 Has SIXTEEN long weekends ! Happy new Year from The Expat Family !